Svg to pdf converts vector formats (specifically svg or scalable vector graphics) to pdf. Scalable vector graphics was developed by www consortium and is an XML based vector graphics format. It is used to display 2 dimensional images and can support animation as well. Since svg format is XML driven, it can easily be searched and indexed on the internet. This application will help you convert the svg graphics files to pdf. Set the properties of the output pdf file that you desire. These properties help in searching and indexing of the pdf. If you do not wish to change them then leave the boxes empty. 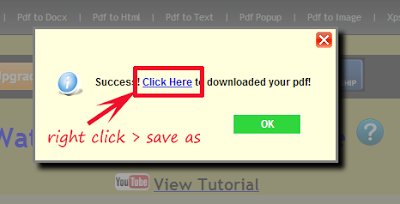 Click on the convert to pdf button and a message will be displayed giving the link to the pdf file for download. Right click on the link and choose save as to download the converted pdf file. Doc to Pdf is one of the most used and required conversions. Microsoft word is very easy to use and widely known (and used) word processor. When editing long documents (doc or docx extension) running into many pages with lots of images, the file size can go beyond the range that is currently supported by web based email services. The file size limitations in most corporate environments are also low. Therefore, it is useful to convert these doc (also docx) to pdf format so that you can easily distribute them. NOTE: The application also supports the doc to xps conversion. Follow these simple steps to convert any microsoft word document to pdf formats online. Click the "choose file" button and select the document that needs to be converted. As said above you can either save the doc file as a pdf or xps. Choose the option that you desire. If you have chosen the output format as pdf then this step will allow to change the basic properties (also called metadata) for your pdf file. Input the properties of the output pdf document that you desire. Click the convert button and a popup will be shown with a link to the output file (pdf or xps whichever was chosen). Right click on the link and choose "save as" to download the file to your computer. Xps to pdf helps convert microsoft xps documents to pdf format. Xps is a open xml paper specification and was developed by microsoft. However, in order to view xps files you would need a special xps viewer. Therefore, if you are distributing the xps file to others it is a good idea to convert the xps document into a more "standard" format that can be viewed by many without the need to install any "special" program. Since Pdf (portable document format) is a more standard format that can be viewed by many, it is advisable to convert the xps document to pdf and distribute it. Our application accurately maintains the layout, image quality and other elements of the xps and reproduce them in the pdf document. Follow the steps below to convert any xps document to pdf format. Click on the "choose file" button and select the xps file on your computer. There are some basic properties like "Title", "Author", v"Subject" and "Keywords" for the output pdf that can be set in this step. These data are the basic properties of the pdf called "Meta data" and help in the searchability of the pdf documents. Click on the "Convert to pdf" button and a popup will appear showing the link to the pdf document. Right click on the link and choose "save as" to download the file to your computer. Pdf splitter helps you extract pages from pdf documents online. If you have a large pdf with 100's of pages and wanted to extract some pages from it and save it as a separate document, pdf splitter comes to the rescue. Using our web application you can extract pages from any position in the pdf document. As with every application at pdfaid, you do not need to install any additional software to splitting pdf files with our program. Follow these simple steps to split pdf documents online. Click the choose file button and select the pdf file from your computer. Clicking this button will read the pdf and determine the number of pages in the pdf document. There are 2 input boxes "From" and "To". Just input the start and the end (inclusive) page numbers that you want to extract. If you need only 1 page then input the same number in both the input boxes. Click the extract pages button and a popup with the link to the split pdf will be presented. Right click on the link and choose "save as" to save the splitted pdf on to your computer. Join pdf files can be used to join multiple pdf files online. In order to join pdf files you would either need adobe acrobat or need to install software programs. Pdf joiner presented by pdfaid overcomes both the issues, it is free and does not need to install anything from the user perspective. You just need to upload all your pdf files and download the joined or combined document. Please select the pdf files in the same order that you would like them to be joined. Note the number beside the choose file buttons (that's the order). If you desire, the application also allows to insert a empty page in between the joined documents. This can help you if you want to have a separator page. Finally, click on the "Join Pdf's" button and a popup will come with the link to download your joined pdf file. The quality of the joined pdf is amazing. Try it for yourself. Extract images from pdf is one of our best applications. Using this application you can save all images from pdf online. Once you upload the pdf file, the application will scan the pdf for all images inside the pdf document and save them in the image format you specify. The program saves the images in the original resolution and retains the color space accurately. Follow these simple steps to save pdf images inside pdf documents. Click the choose file button and select the pdf document from your computer. In this step select the image format in which you would like to save the images. We support Jpg, gif, png and bmp image formats. We however recommend that you select Jpg or Png. Lastly click on the "Extract Images" button and the application will extract all the images from the pdf document, put them into a single folder and present the link to the zipped folder containing the images. Right click and choose save as to save the zip file to your computer. 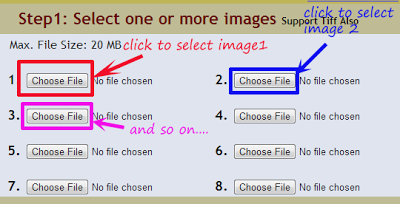 Once it is downloaded to your computer, right click in the file and choose "Extract" to extract all images from the zip file. Webpage to Pdf converter is our application in beta. This web application can be used to convert any webpage or custom html to pdf online. It does not require the installation of any program. The hyperlinks inside webpages are automatically converted to pdf links. Form data inside the webpages are also converted to pdf form elements. Note: This application is still in beta as there are various issues that need resolved with this application. As was said above, the application can be used to convert both webpage and custom html code to pdf online. There are 2 tabs in the application. The first tab can be used to convert webpages to pdf online. This tab contains a text box where you can input the web address and click on the "generate pdf" button. The second tab has a html editor where you can paste your html code or build the html using the designer interface. Subsequently a click on the "generate pdf" button will help you save the pdf. As mentioned previously, this app is sometimes unstable so please leave your feedback and help us improve the application. Jpg to pdf (also jpeg to pdf) is an online application that can be used to convert images to pdf. The application allows images in jpg, gif, png and bmp formats. Multipage tiff images are also allowed. Tiff images that contain pages (with images) can also be uploaded. Our program will extract the individual images from the Tiff image and embed them into the pdf. Follow these steps to convert jpg to pdf online for free. Click on the select image buttons to select individual images. You can also select multi-page tiff and the program will extract all the images from the tiff and use them. NOTE: Select the images in the same order as you want them to appear in the pdf document. 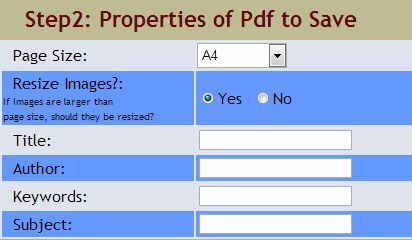 Pdf page size: Select the pdf page size from the drop down box. If you are not sure, then the default option "A4" is good as it is a most common size. 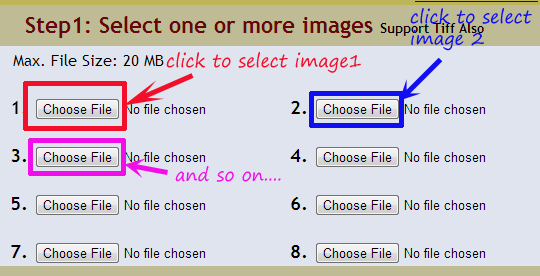 Resize Images: If you select this option as "yes" then the images will be re-sized to fit into the pdf page. If the selected option is "No" then the images will be embedded in their original size into the pdf. If you are not sure what to select then it is "yes" that you would most probably select. Meta data: You can input meta data like "Title", "Author", "Subject" and "Keywords". Meta data in pdf documents help in increasing the search-ability of the pdf. So enter these values so that your pdf is visible to search engines. If you do not want to change the existing metadata, leave the fields empty and the application will not change the metadata. A popup will appear with the link to download the output pdf file. In order to download the pdf file, either right click the link and choose "save as" or click the link to open the pdf. That is it. Should you have any problem, please leave a comment and we will get back as soon as possible. Watermark Pdf online tool was one of our first applications. The application can be used to add a watermark to your pdf files. Before you distribute pdf files online, it is advisable to watermark them with your brand name. The application has several options to fine tune the look and feel of the watermark. The font size, font color and placement can be changed to your liking. Follow the steps below to watermark pdf files. Option 1: Right click the link in the popup and choose save as. Select a location on your computer and save the file. Option 2: Click on the link and the pdf will open in a new window. Use the save button in adobe reader to save the file. (c) PDFaid.com. Watermark theme. Powered by Blogger.